June 16, All Out to Catherine Ferguson Academy! What are entry points for community members to engage with schools? How can a school play a role in the community’s life? Catherine Ferguson Academy is hosting a community potluck in the schools auditorium this Wednesday, May 18th 7-9pm to discuss school closures and the changing educational atmosphere in Detroit. Gather with other Detroiters to share food while discussing and sharing perspectives on how we can strengthen community involvement in Detroit schools. 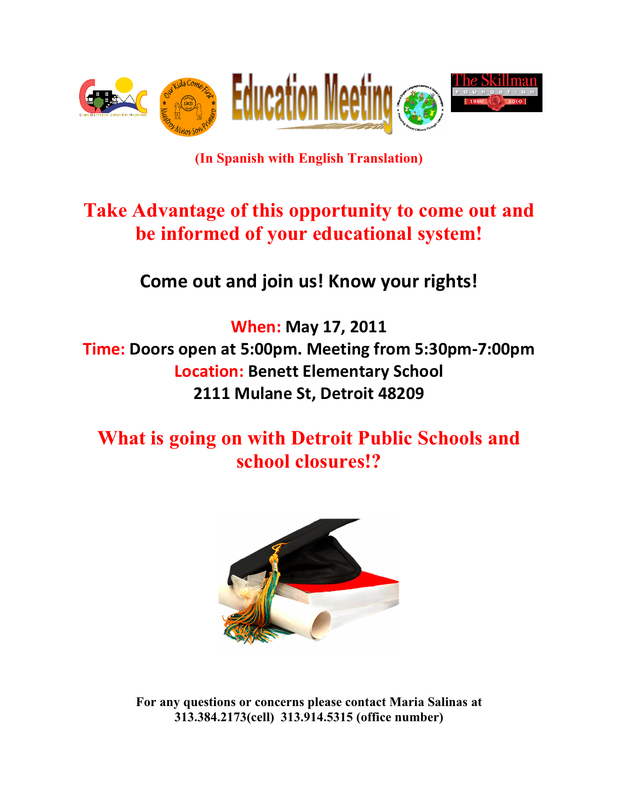 Students, teachers, families and anyone involved from Detroit schools – public, private and charter – and non-affiliated community members – are especially encouraged to participate. Everyone is welcome! Principle Andrews, students, and teachers will be in attendance. Your participation is most welcomed and appreciated. Pass the word along. Bring your favorite dish to pass. Southeast Michigan Jobs with Justice is organizing a bus tour to three west side Detroit neighborhood public schools slated to be closed. 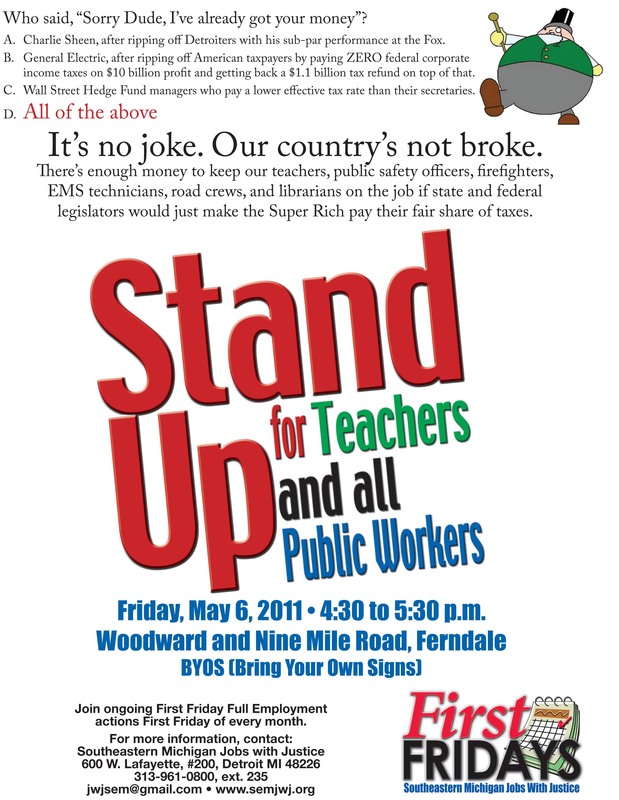 The bus leaves from the Detroit Federation of Teachers office this Friday morning, May 13 at 8AM. We want to investigate the programs at the school and see what impact the school closings will have on the community. JwJ plans to organize a similar tour on the east side two weeks later. March and Rally to Keep Your School and All Schools Open! at Robert Bobb’s Office 3011 W. Grand Blvd., Fisher Building. Facing severe budget cuts, Detroit Public Library will host two community forums this week to discuss its current funding crisis and get ideas on how to best serve Detroiters. No announcements will be made about specific branch closures. Be warned: individuals who sign up for the comments portion are given two minutes to speak. You can also tell DPL what you think by emailing them at ideas@detroitpubliclibrary.org. Friday, May 6, 2011, 6 p.m. – 8 p.m.
Saturday, May 7, 2011, Noon – 2 p.m.
People’s Movement Assembly: Follow-up conversation on education and schools. 6pm @ Earthworks 1264 Meldrum. Woodward and Nine Mile, 4:30-5:30 p.m. Stand Up for Teachers and All Public Workers! From the Michigan Citizen: House Democrats Invite Detroiters to Discuss State Education Funding, 5 p.m. to 7 p.m. at the Main Branch Detroit Public Library, 5202 Woodward Ave.
Tuesday, May 3–Postponed by Bobb’s Office. Demonstrate Your Support for Public Education! ( ::: wear a pillow under your shirt as a visual demonstration if you’re not already pregnant ::: ) Gentlemen, you too! Pregnancy is a leading cause of teenage dropouts in the United States. For over twenty years, The Catherine Ferguson Academy in Detroit, Michigan has acted as an educational and community center for pregnant and parenting teen mothers, and their children in the Detroit area. Catherine Ferguson Academy will be one of 18 schools to close or become a charter unless we speak up and show up in numbers. CFA provides services like WIC, healthcare, and early education from birth through pre-K. Without this support, most high school aged mothers do not graduate. In addition to being a successful school, CFA is an anchor to the community of young mothers. Also: Be aware that the same day CFA is up for its presentation, 2 alternative schools, the Day School for the Deaf, AND a school that serves students with cognitive impairment and autism are also defending their right to exist. We cannot give up on the students who have refused to give up themselves. These schools are a success story and represent a different vision for education.